What do you do when your arms are aging, but you're not ready to stop wearing sleeveless dresses or tops, especially to evening weddings or holiday parties? That's been one of my fashion over 50 dilemmas lately. I find plenty of good-looking long-sleeve dresses and tops for daytime, but they're not stylish and sophisticated enough for evening. For once, I'm happy to say there's an elegant solution: the evening wrap. An evening wrap is dressier than everyday shawls. They're made with luxurious materials--chiffon, satin, velvet, to name a few--and often have a little shimmer from sequins or metallic embroidery. Because they're so many choices in evening wraps, it's easy for the woman over 50 to find one to match her personal style. Click "read more" for more on evening wraps and where to shop. 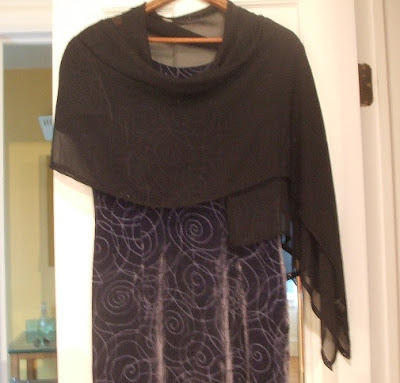 At a recent wedding I attended, I had to smile: Just about every woman over 50 was wearing a sleeveless dress or top with a shawl draped over their shoulders. 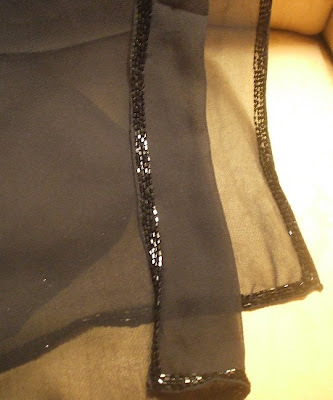 I wore my favorite LBD and a sheer black shawl with bead trim (above and below). I had thought about wearing a dressy suit to the wedding, but October in the Northeast has been so mild. Clearly, the other over 50 guests were thinking the way I was. What I love best about the evening shawl is it doesn't make a woman look like she's "making do" or desperate to hide her arms. Instead, a beautiful, feminine shawl completes an outfit. At the wedding I attended, no two evening wraps were alike. I love my sheer wrap because the beaded trim adds a little weight and keeps it in place. 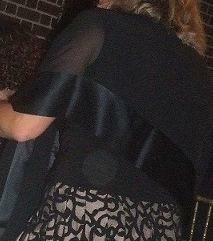 But my favorite wrap at the wedding was the black sheer and satin one below. Macy's -- Style Co. offers a pretty Scattered Sequin ($26.89) wrap in black or white. Or if you'd like a little color, take a peek at the Wrap, Sequin and Lurex Stripe ($26.98) in Plum. Glittery Shoes Say "Special Occasion"
Fashion Over 50: At Last, A Designer for Us! Vivien, Queen of the Over 60s?